One challenge I've had since I moved to the paperless classroom has been the use of the Venn Diagram. Now, I'm not a history teacher. I'll won't use a VD more than once or twice a semester, but today, I discovered a remarkable tool that Google has added to Docs/Drawings. We have been reading the Iroquois origin myth this week--the turtle's back, the muskrat, the right-handed and left-handed twins, etc. 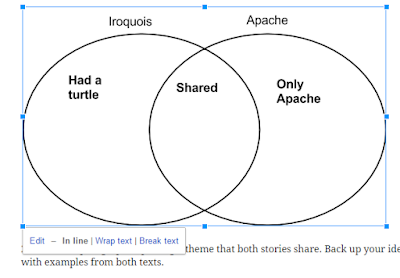 I like to close out the unit by comparing the Iroquois with at least one other myth--usually the Apache. Why? 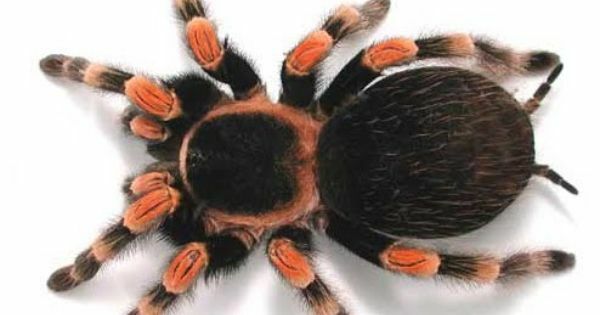 Because any culture that can incorporate a Tarantula into its origin myth is AWESOME! Fill in the blanks with 2-4 examples for each. Anyone who knows teaching knows that the likelihood of getting a full class to follow these directions in 1 or 2 tries is low. 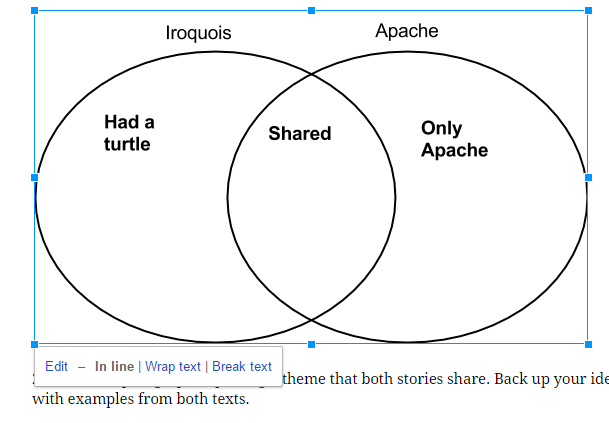 Today, as I was showing the assignment to students, I noticed something different about the Ven Diagram I had placed in the worksheet two or three years ago. It was the word, "Edit," in the lower, left-hand corner! This is my first year using Google Classroom. When I had assigned the activity, I had chosen, "Each student will get a copy." Now, on their own worksheets, students could edit and add what they had learned without following complicated directions!